Around 10 million people in the UK suffer from a neurological disorder, one million of whom are disabled by their condition. Neurological disorders that can affect cognitive functioning include stroke, head injury, multiple sclerosis and dementia. Historically the emphasis within neurology has been on diagnosis. Now neurologists also have to train in neuro-rehabilitation in order to help patients to cope with their condition, and they increasingly work within multi-disciplinary teams. The bulk of the book is formed of sessions plans for the six sessions over which the group may be run. The session plans includes a ‘script’ for the facilitator, slides and handouts. The introductory chapter will review the literature supporting the implementation of such groups, and the final chapter will go through some of the frequently asked questions. Dr Andrew Champion is a Clinical Psychologist within the Health Psychology department at Gloucester Hospitals NHS Foundation Trust. He has published numerous journal articles in the area of clinical health psychology. 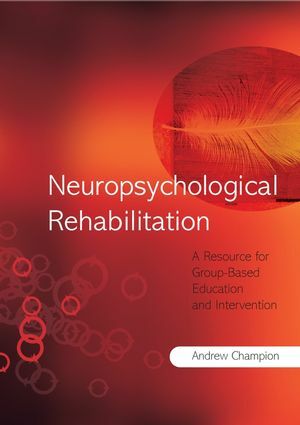 Chapter 1: Information Provision in Neuro-rehabilitation. Chapter 2: Before the First Session. Chapter 3: Introduction to the Brain and Brain Injury. Chapter 7: Thoughts and Feelings. Chapter 8: Communication, Planning Movements and Perception. Chapter 9: Frequently Asked Questions.